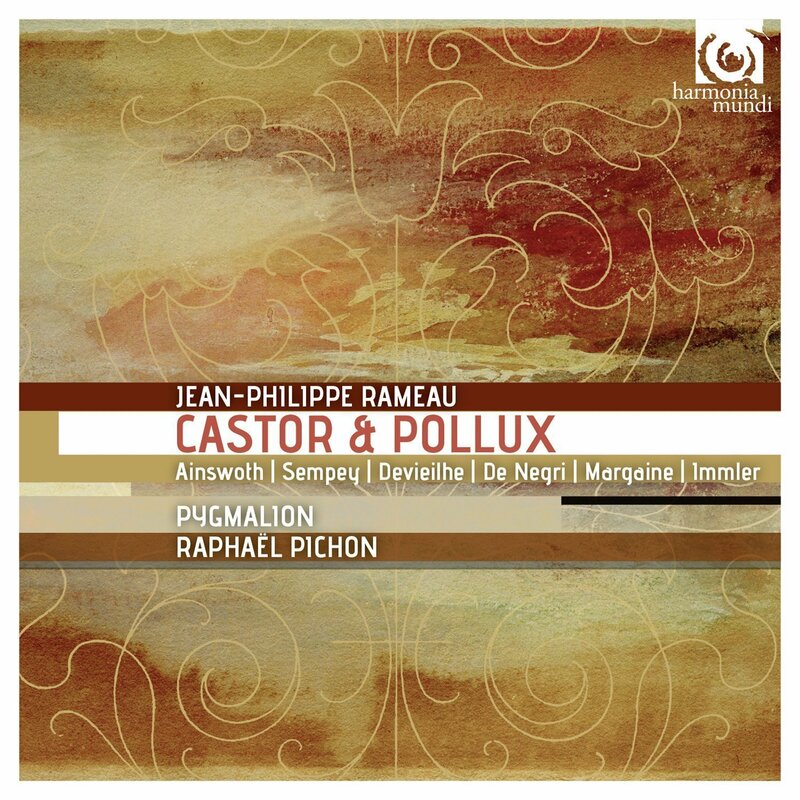 Jean-Philippe Rameau's opera Castor et Pollux had a rather varied history during Rameau's lifetime. Indifferently received on its premiered in 1737, Rameau waited 17 years before revising it. This revised version of 1754 has received a new recording from Raphael Pichon and Ensemble Pygmalion on Harmonia Mundi with Colin Ainsworth as Castor, Florian Sempey as Pollux, Emmanuelle de Negri as Télaire, Clémentine Margaine as Phébé, plus Christian Immler, Sabine Devieilhe, Philippe Talbot and Virgile Ancely. 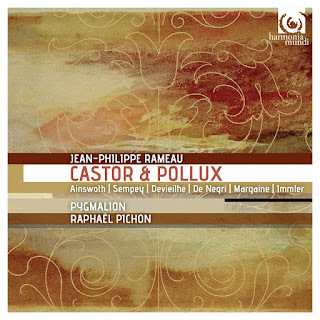 Rameau wrote Castor et Pollux originally in 1737 after two of his major successes, Hippolyte et Aricie and Les Indes Galantes. Castor et Pollux dealt with the love of the twins Castor and Pollux for the same woman, Télaire. The music's novelty disconcerted the public and the piece was not a success, but those very qualities attract us to the work today. Admittedly, the oddities of the plot cannot have helped the original reception. After a prologue, the opera opened with Castor's funeral and he only reappears (resurrected) in the final act. When Rameau finally came to revise it, he worked again with the original librettist, Gentil Bernard. They removed the prologue, streamlined the plot, and added a first act with Castor still alive so that Act Two now opens with Castor's funeral. There are still weaknesses and oddities in this version. The role of Phébé (in love with Pollux and responsible for Castor's death) is a bit flimsy, and a Tragédie en musique where the only haut-contre disappears at the end of Act one and does not reappear until the end of Act Four is surely a bit problematic. But the subject of two men in love with the same woman had resonance for Rameau, and the revised version places strong emphasis on the fraternal bond. This isn't the work's first time on disc, and this revised version appeared 10 years ago on Naxos performed by Kevin Mallon and his Aradia Ensemble with Colin Ainsworth as Castor (Ainsworth sings the role on this new recording). On this disc, Colin Ainsworth is finely flexible as Castor and matched in style by the high baritone of Florian Sempey as his brother. It is Florian Sempey who has to carry the core of the work when Castor is in the underworld, and Florian Sempey does so in a highly expressive and stylish manner. Emmanuelle de Negri as Télaire, the woman loved by them both, gets one of the opera's hit numbers, Tristes apprets and she sings it intensely indeed, some finely rich bassoon playing in the orchestra. Clémentine Margaine rages suitably as Phébé but she cannot disguise that she is there to facilitate the plot rather than as an essential part of the dramatic development. I did rather feel that her exit aria could have been stronger though; finely sung, it rather lacked the dramatic intensity needed. Not all the smaller roles sound completely comfortably taken (I am not clear how much studio recording this is and how much live, though it seems to be based on concerts last year), though all sing with a fine sense of character and the overall drama of the piece comes over very well. Raphael Pichon directs an engaging and involving performance, with some strong playing from all concerned. The opera is made up of such diverse elements that getting an ideal version is tricky, and not every approach will suit everyone. There are slight differences between the current version and the one on Naxos, though the CD booklet talks about Raphael Pichon using a 'manuscript close to the autograph that Rameau finalised in the last months of 1753'.